What is pyrethrum? 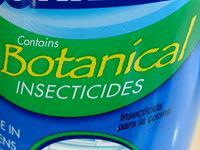 Is it a safe organic pesticide? Pyrethrum refers to the Pyrethrum daisy (Chrysanthemum cinerariifolium) from which the insecticidal compound is extracted. Also nicknamed Dalmatian chrysanthemum, this perennial daisy is loaded with chemicals called pyrethrins that are toxic to insects. Since it is directly extracted from a plant, and since it is considered nontoxic to humans, pyrethrum is approved in the U.S. for use on certified organic farms. Pyrethrum: The general name for an insecticide derived from the Pyrethrum daisy. Pyrethrins: The active chemicals in pyrethrum. “Pyrethrum” and “pyrethrin” are often used interchangeably. Pyrethroids: Synthetic pyrethrins. They are much more toxic than natural pyrethrins and are not approved for organic gardening. Permethrin: An example of a synthetic pyrethroid, not to be confused with its natural counterpart! Kills Beneficial Insects: Pyrethrum is highly toxic to most insects. This means that it’s effective against the pests, but it’s also deadly to the beneficial insects that pollinate your vegetables and help out by eating those pests. Best for Spot Spraying: Like any powerful compound, pyrethrum should be used only for spot-spraying heavily infested plants. You shouldn’t be dousing the entire garden with it. Other Ingredients in Pyrethrum: Pure pyrethrum is hard to find. In fact, I couldn’t find it at any of my local garden centers. Pyrethrum is very effective at “knock-down,” which means flying insects will hit the dirt when sprayed with it. However, if the dosage isn’t high enough, they can revive. For this reason, pyrethrum may be mixed with other ingredients to increase its effectiveness, and some of those ingredients might be neither organic nor nontoxic. Pyrethrins are often mixed with piperonyl butoxide (PBO), a toxic, non-organic chemical to make it more potent. It’s also often mixed with other organic ingredients such as neem oil or insecticidal soap. Read labels to make sure you’re getting 100% organic ingredients. Human and Animal Safety: Pyrethrum is touted as being “non-toxic.” Truth is, pyrethrum isn’t harmless, but it is one of the least toxic pesticides out there. It’s toxic to fish and amphibians, though, so it should be kept out of storm drains and waterways. Pyrethrum Benefits: Pyrethrins are biodegradable and break down quickly in sunlight (within a few days). They don’t persist in the soil or on your veggies, which is one of the reasons they’re considered relatively safe to use around food crops. Growing Pyrethrum: You can grow Pyrethrum daisies in your own garden to repel pests, and you can even harvest and dry the flowers to grind into your own insecticidal powder. They’re pretty plants, with lovely white daisy blossoms with yellow centers. I have been using the natural pytherum since 1991. Yes, I spray it in the evening. However, blasting the same plants before dawn with water from a hose will rinse it off, saving our honey bees. That is if Bayer/Monsato Nicotien sprays have never been used. Nicotien is sold under seven names. It will be within a word like “neonicotietania ‘ or some other made up name. The rule of thumb, if you can isolate nicotine in the ingredients , do not ever use. The drug is systemic, dig up destroy. Is pyrethrum pour-on safe on milk goats? Is there a residual clear time to allow for the chemical clear out before drinking the milk? Garden Safe Houseplant & garden insect killer should only be used at night & directly the infected plant not generally over all. The reason is because bees are in the hive at night: if you spray in the daytime bees will be killed as well as the bad bugs. I gather that pyrethrin kills mite safely, what what about the first cousins that live on animal (and sometimes human) skin in the SARCOPSIS family – mange and “scabies”? My dog has developed allergies to something outdoors. The grounds are regularly sprayed with something with Chrysanthemum oil or Pyrethrum . Is it harmful to dogs or other small animals? Is pyrethrum safe to spray on my brocollini seedlings? If I enter a household using pyrethrum, I have an all out allergy happening. Explain that? I’m not convinced this product is harmless. My daughter in law can’t handle the stuff either. Pyrethrins are the natural insecticide found in daisy like Chrysanthemum flowers grown and harvested in Kenya, Africa and Australia. 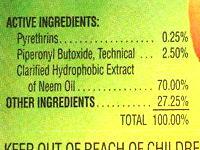 Pyrethrin is considered a Botanical “natural” insecticide because it is derived from plants. is pyrithum safe to use inside my home. Are there any guide books out there that wil show you how to dry the flower, what part of the flower to dry, when to harvest the flower to gain pyrethrum. I would like to do a home brew right from the flwer itself and test it and see how it works.